I have a huge soft spot for Aussie pop/rock from the 1980s, and this week in 1988, a band whose success was mostly confined to that decade made their debut. Given the decade only had 16 months left, they certainly wasted no time getting to business. The band couldn't have been more quintessentially Australian if they tried, with classic group Moving Pictures and Hey Hey It's Saturday's talent quest, "Red Faces", playing a part in their formation. 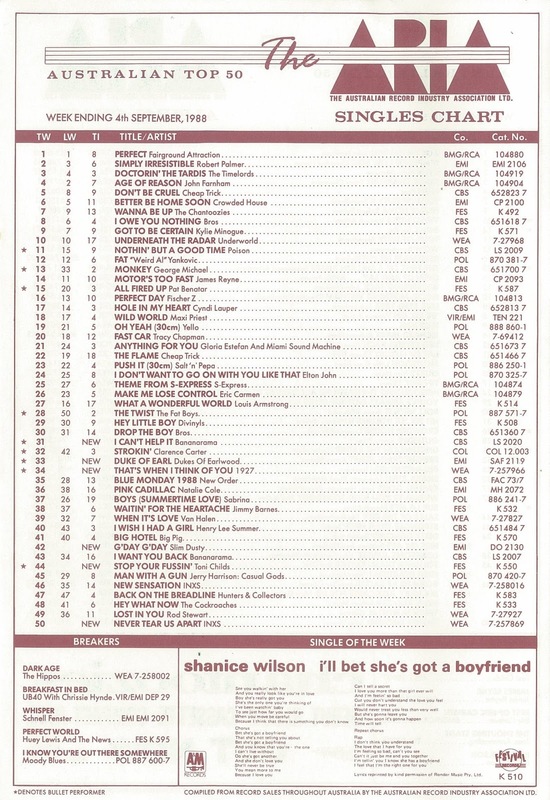 1927 wasn't the only local act to debut this week in 1988, with an interesting variety of home-grown artists appearing on the top 50. Meanwhile, at the pinnacle of the top 50, Fairground Attraction maintained the number 1 position with "Perfect", although Robert Palmer was closing in fast. Former lead singer John Farnham's comeback was still unstoppable, but looked like Little River Band's resurgence was over with this follow-up to "Love Is A Bridge" proceeding just one more spot. It would take her four more years (and the absence of her surname) to score a hit in Australia with "I Love Your Smile", but before that, 15-year-old Shanice burst onto the scene like a mini-Janet Jackson or Pebbles. Well, perhaps "burst" is the wrong word since none of the singles from her debut album, Discovery, amounted to very much. 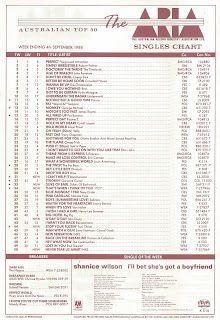 Lead single "(Baby Tell Me) Can You Dance" performed best, but still only reached number 50 in the US, so quite why Shanice's Australian record company decided to push this fourth single here is unclear. Australia's biggest band followed "Need You Tonight", "Devi Inside" and "New Sensation" with this rock ballad, which is also the title of the upcoming miniseries about the group. Although it missed the top 10, "Never Tear Us Apart" was a decent-sized hit considering it was the fourth single from Kick, an album that was coming up to its first anniversary. No doubt the memorable music video - which, like the clip for "New Sensation", was shot in Prague - helped matters somewhat. She may not be Australian, but we certainly adopted the big-voiced American singer as our own over the next few years, with this debut single the first of a handful of big hits. Although a number 17 peak might not sound so impressive, "Stop Your Fussin'" spent five weeks at that position and never seemed to go away. This is where I draw the patriotic line, since, like John Williamson's "True Blue", this song by the Australian country music legend sounds almost nursery rhyme-ish. "G'day G'day" was, however, Slim's first single to hit the top 50 since his 1980 chart-topper, "Duncan" - which, in turn, had been the singer's first chart hit since his original "Pub With No Beer" trilogy back in 1958. While he hit number 1 on both of those previous occasions, he had to make do with a much more modest hit this time round. We have a brand of shampoo to blame for this single, a cover of the 1962 hit by Gene Chandler. In 1988, Decoré released a memorable ad, featuring a range of semi-naked people taking a shower and miming along to the doo-wop classic. While in the UK, the original single would have been re-released (and no doubt would've gone to number 1), in Australia, the remake charted. I'm not sure if the group actually came from Earlwood (which was the next suburb from where I grew up), but singer Armondo still seems to be around. One minute she's out, next minute she's back... Due to a change in the order Bananarama singles were released in Australia, departed member Siobhan Fahey was suddenly restored to the line-up for this final single from WOW. "I Can't Help It" had actually been the third single from the album, and Siobhan's last appearance with the group, but because fourth single "I Want You Back" (the first to feature new member Jacquie O'Sullivan) had been a bigger hit in the UK, it was released first in Australia. Another classic Stock Aitken Waterman production, "I Can't Help It" came with a video Siobhan had shot while quite pregnant - although that fact was effectively disguised. Next week: the return of one of Australia's top stars, with a song written by one of the world's biggest music acts. I think he's definitely a national icon - but I still don't like the song. Sorry! It really was strange that 'I Can't Help It' was released here after 'I Want You Back', though I don't remember being conscious of Siobhan being 'back' at the time. Maybe because I only caught the video a few times on TV then, and didn't recognise Siobhan with the red hair (?). Surprised it wasn't a bigger hit though (here or in the UK), as I think it's one of the best from 'WOW!' The 'captivated by your honey' lyric though didn't make much sense to me at the time. I remember 'Never Tear Us Apart' being played on radio for quite a while before it was released as a single here, perhaps even pre-dating 'New Sensation's release. Project Re-embed has begun! I'm still back in 1987, but since it'll take a while to get to Sept 1988, I did this one now.